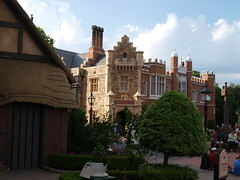 The other week, I shared a link to AllEars.net that described the inspiration for Epcot’s UK pavilion. Now en route back to Chicago before I fly back to London on Monday, I’ve already visited the UK pavilion myself and can report on what it got right. First of all, it was pouring the day I went there, so tick one box for UK authenticity! 😉 Because of the rain, the Rose & Crown pub there was standing-room-only with adults seeking dry shelter and warm ales—basically, it looked like 5:00pm in a London pub on any given weeknight, so tick another box! I would have loved to have had a pint there myself, but it was just too crowded, so we milled around inside the shops instead. The tea shop carried assorted Twinings teas, pots, cups, and saucers as well as digestive biscuits, shortbread, and those Jammie Dodgers cookies that creep me out so much with their demented monkeys in the UK ads. There was also cute apparel sporting the Union Jack or Princess Diana tartan and a little room of Irish jewelry (which the spell-check on my UK computer is now reminding me is spelled “jewellery” in British English) dominated by Celtic patterns. It was at this point that I noted the UK pavilion should clarify somewhere that Northern Ireland is, indeed, part of the United Kingdom whereas the Republic of Ireland is NOT (see my earlier blog series, “Relocation UK: The LESS Lazy Expat’s Way to Understand UK vs. Great Britain”—which followed on my utterly lazy way—for clarification on that). In any case, soon enough I’ll be back in London and writing from a more local standpoint, but I thought it would be fun to share what bits of the Brits we’re exposed to here in America and how accurate a reflection that is on the actual culture. I think the UK pavilion suffices as a darling snapshot of Britain, but lucky you and me who get to actually relocate to London and learn much, much more about it first-hand. Cheers!